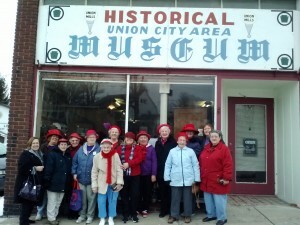 Founded in 1965 by the citizens of Union City as a repository of our region, the Union City Historical Society Museum’s collection is quite extensive and is the only one of its kind in Northwestern Pennsylvania. The community of Union City, once known as Miles Mills, was founded in 1789. William Miles developed the community as a market and industrial center. Settlers found the region to be covered in primeval forest with large open tracts among the rolling hills. 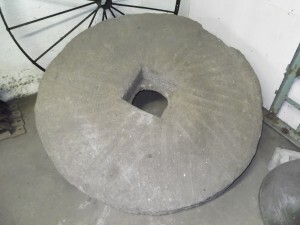 Within the collection you will find many unusual items of everyday use from the 18th and 19th century rural and urban life. Admission is free, but donations are gratefully accepted to keep up the collection. On the first floor there is a large collection of memorabilia. William Miles, founder of Union City’s portrait from 1820, his surveying tools from 1787-88. Elmer Ottaway’s General Store counter and equipment and a large wood burning kitchen stove and period kitchen utensils. The side saddle on which Mrs. Hanna Wilson traveled with her small baby in her arms to Miles Mills in 1790. The second floor has a wonderful collection of tools, medical, and barber shop items. Lumbering, farming, home improvement and maple sugaring tools are also found here. There is also wash day memorabilia from the turn of the century. Glass rooms display women’s wear and 1890 bathroom and toys. The back rooms contain a one room school house, music parlor, bedroom and a full kitchen. Sewing machines, spinning wheel and floor cleaners fill out the collection. The third floor front contains articles manufactured in Union City by our many artisans and craft people. The center room (War Room) is full of items from the French and Indian War to Desert Storm. The back room features a collection from the Laskaris Ice Cream Parlori as well as items from the Union City Police and Fire Companies. Here you will also find the projectors from the Palace Theatre and Coleman Band instruments. A large collection of business machines, radios, and televisions are also displayed. The collection is large and diverse, our community small and friendly. 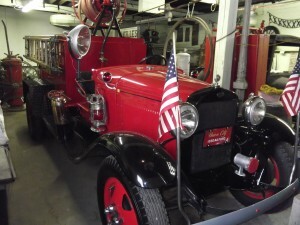 Come share our treasures and local history. Union City is easily accessible from Primary State Routes’ US 6 & 6N, US 8 & Route 97. The Museum is located on South Main Street (US Route 8 south) just across the bridge next door to the American Legion Hall and the City building. The map will aid you in your trip to the Museum. The trip will take you through the historic French Creek Valley and some of the best scenery in the State of Pennsylvania. So have a safe trip and enjoy the ride.